Welcome to the first edition of The Advocate for 2019. Landcare NSW recently held a Council Induction Workshop for its Council members and it was a great opportunity for our new Councillors to find out more about the organisation, meet the staff team and hear from our Executive Committee members. We also held our Quarterly Council Meeting and Partnership Forum in Sydney. I would like to thank all Councillors who attended and also our partner guests; Alan Goodwin (Biodiversity Conservation Trust), Bryce Wilde (Natural Resource Commission) and Chris McCulloch (Local Land Services). The meetings set the scene for what is already proving to be an exciting year. You can read more about the latest developments including the announcements relating to state government funding commitments, plans for the future of the NSW Landcare Program and Local Landcare Coordinator Initiative and Landcare NSW’s involvement in this year’s Sydney Royal Easter Show in this edition of The Advocate. The Landcare NSW Team, Executive and Council are looking forward to supporting all Landcare initiatives in NSW during 2019. Provide Landcare NSW with a review on Google! 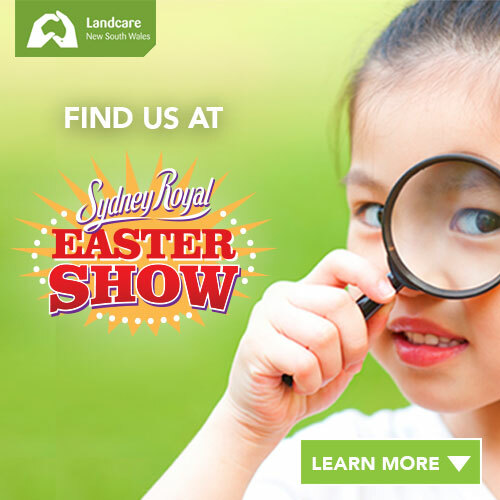 For the first time ever, Landcare NSW will be at the Sydney Royal Easter Show! The Show is Australia’s largest annual ticketed event, attracting over 900,000 attendees on average. During the Easter long weekend, from Good Friday 19th – Easter Monday 22nd April, Landcare NSW will be giving away native seed sticks and providing fun, educational activities for children of all ages. Landcare NSW will be located near the rest area and main Amphitheatre. This is a fantastic opportunity to showcase the work Landcare is doing across NSW. Funding commitments have been announced by both the NSW Government and NSW Opposition for the NSW Landcare Support Program (formerly LLCI program) 2019-2023. The NSW Local Landcare Coordinator Initiative (LLCI) is funded to June 2019 and Landcarers would like to see Landcare support continue seamlessly into 2019-2020 financial year and beyond. It is the intent of the program management team and the Joint Management Committee that the transition between the current program and any future program is as efficient as possible. Over the coming weeks, we will be working with a number of stakeholders including current participants to consider a process going forward and the details of how the new program will be implemented. We will be looking at the needs of Landcare across the state and each region, in the context of the current climate to ensure this program is best designed to address the challenges we face now and to build on the momentum of the current program. We are looking at what works, what needs to improve and where there are opportunities to build the level of success of Landcare as a whole across NSW. As we move towards the end of this current program, we will be continuing to engage with all those involved with the aim of an effective, smart and efficient transition between programs. We will keep you updated as much as possible and you can expect to hear more from us over the coming weeks. Landcare NSW has recently signed a Memorandum of Understanding (MOU) with Landcare Australia to set the framework to allow for discussion and negotiations towards a newly formed federal Landcare peak body which will replace the previous National Landcare Network and Landcare Australia. Negotiations to date have included removing an attachment with elements of a draft constitution for the new federal Landcare peak body, which Landcare NSW deemed unsatisfactory. While the MOU signifies significant and positive progress, Landcare NSW acknowledges that further discussions are required over the coming months to ensure that this new national peak body supports, grows and furthers the interests of each of the state and territory peak bodies, those of the community Landcare groups and networks across Australia, and that the new national Landcare peak body is truly representative of community Landcare. Landcare NSW will continue to consult with its Landcare members throughout the ongoing negotiations and update them of significant progress. In late 2018, the Joint Agency Drought Taskforce held a National Drought Summit in Canberra and a regional consultation meeting in Dubbo. Landcare NSW welcomed the opportunity to provide input into the development of a national drought management strategy and submitted a paper which raised a number of issues and areas of concern. Commonwealth could address the issues identified during the consultation process. Landcare NSW feels that the Consultation Paper adequately addresses all of the issues raised by Landcare NSW and endorses the recommendations of the paper. Landcare NSW seeks to remain actively engaged in future discussions on policies related to drought management and resilience. Photo shows: David Marsh on his Boorowa property now and in 1982. Boorowa farmers, David Marsh and Charlie Arnott, are weathering the long dry spell much better than they did in 1982/3. This is despite 2018 being one of the driest years on record across much of New South Wales. Both credit regenerative agriculture, and the ability to always match the stocking rate to the dynamic carrying capacity of their land to vastly different outcomes than in the past. Even in this long dry spell (September 2017-to the present), using planned grazing has led to high ground cover, people with low levels of anxiety and farm businesses that have been profitable due to the low costs of running a farm on regenerative lines. (No feed costs). David also believes that the support provided by Local Landcare Coordinators is fundamental to community resilience especially during these hard times. Boorowa Community Landcare Group Local Landcare Coordinator Linda Cavanagh said part of their role has been to meet farmers wherever they are in their regenerative farming journey and provide support where needed. “We meet people at their level and encourage them to make some changes on their properties and the way that they do their grazing management,” Ms Cavanagh said. David and Charlie were recently recognised for their work as part of the National Landcare Awards with David Marsh awarded the 2018 Australian Government Individual Landcarer Award and Charlie Arnott the recipient of the 2018 Bob Hawke Landcare Award. Read more about David and Charlie in the recent ABC Rural article here. In April 2018, Milton Rural Landcare Inc launched the Atlas of Life Budawang Coast through a biodiversity recording platform called NatureMapr. The aim of this project is to identify as many of the living creatures of this region as possible over the next years to help people explore and learn more about this place, and to provide an ever growing rich database of biodiversity information for locals and visitors, naturalists other scientists and students. 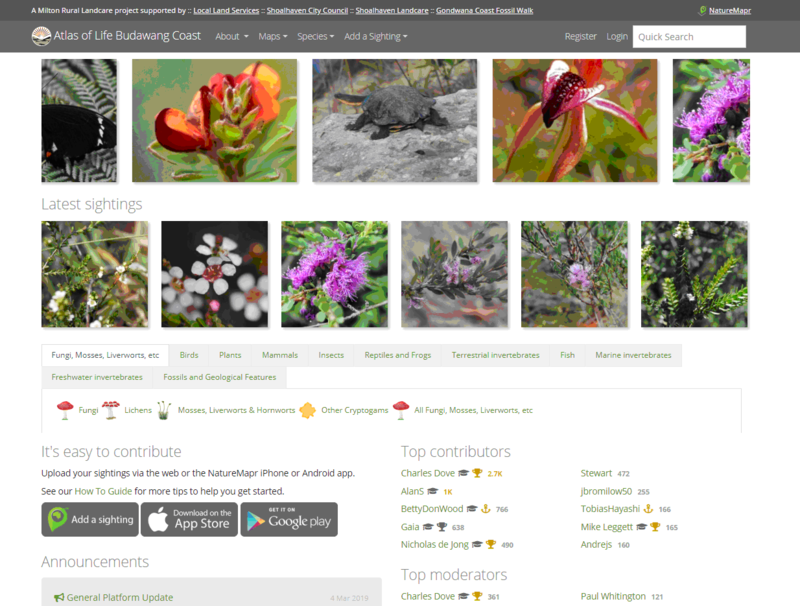 This platform links geographically and digitally with the Atlas of Life in the Coastal Wilderness on the far south coast, and Canberra Nature Map, to now cover all of south-eastern NSW. 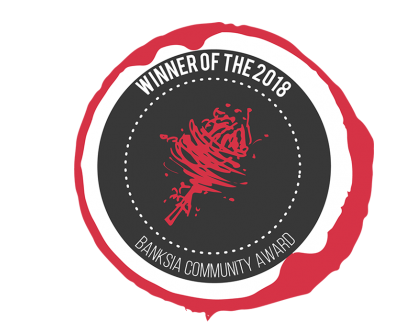 In 2018, the NatureMapr Network won the Banksia Community Award, which recognises how this unique community-led citizen-science initiative with partnerships across government agencies and community groups including Shoalhaven Landcare can add real value to regional management for environmental sustainability. To date the network has attracted over 2,000 contributors, recorded over 1.18 million sightings of over 7,000 species. The contribution from the Atlas of Life Budawang Coast in less than 12 months is 319,519 sightings of 6,826 species in 315 locations from 243 members. Once moderated, data contributes to the Atlas of Living Australia and thence to the Global Biodiversity Information Facility. These projects are also engaging community and data gathering at the detailed granular level being requested by the United Nations for reporting progress against their Sustainable Development Goals. The NatureMapr network can readily replicate this successful model and offer support to any region which is keen to develop the same kind of project. Members of the network also offer tools developed here such as the “Australian Guide to running a BioBlitz” and are currently developing mechanisms for reporting to the UN’s Sustainable Development Goals, both regionally and globally and will offer these widely. Find out more about the Atlas of Life Budawang Coast here. Landcare NSW and the Biodiversity Conservation Trust (BCT) have signed a Memorandum of Understanding (MOU) for both organisations to work together over the next two years for the delivery of BCT projects across NSW. A working group made up of staff from both Landcare NSW and the BCT has been formed and are meeting regularly to work on the details of scope and budgets for BCT projects that would be rolled out across the state through Landcare NSW. The MOU signed is a not a legally binding document and does not contain any detail in relation to the nature and scope of BCT projects nor fees that would be paid for their delivery. Landcare NSW will be consulting all its members once details are available before entering into any agreements with the BCT. The first phase of the Managing Established Pest Animals and Weeds (MEPAAW) project has been completed with 11 regional workshops held across NSW. These workshops saw 157 participants from Landcare organisations, Local Land Services, NSW DPI, local weeds control authorities and others working collaboratively to develop and prioritise weed and pest animal training and extension projects to meet the needs of their region. From the regional workshops a prioritised list of pest animal and weed activities has been collated and some state-wide issues and potential programs identified. Landcare organisations who are members of Landcare NSW and participated in the planning phase of the project, and LLCI host organisations have been invited to submit an Expression of Interest (EOI) to deliver activities identified as priorities for their region. Collaboration between neighbouring Landcare organisations and other partners has been strongly encouraged. Sixty EOIs have been received from across all of the 11 regions. These EOIs have been reviewed against the priority activities from the regional workshops. Project agreements are currently being negotiated between Landcare NSW and the Landcare organisations for the delivery of the agreed outputs. The timeframe for delivery is tight so there will be many interesting weed and pest animal activities happening across NSW in the next couple of months – keep an eye out in your area! The NSW Environmental Trust will again open funding rounds later in 2019. The Office of Environment & Heritage (OEH) recommends that community groups, like Landcare begin the groundwork now including developing project ideas, considering collaboration and planning for applications within the Restoration and Rehabilitation and Environmental Education programs. In anticipation of this, and in response to few high quality projects being received and funded from the west previously, a workshop has been organised on Monday 25th March (11am – 3pm) in Dubbo to provide tips on the application process. RSVP and enquiries to David Walker, OEH at David.Walker@environment.nsw.gov.au, 6883 5332 or 0472 872 145. “Landcare is a very interesting, fascinating but complex area to be working in and it took me a while to get to grips with the complexities of this grassroots volunteer movement. In a way I am still learning and I think I will never know everything about it. That is what makes it so wonderful but challenging at the same time. I have very much enjoyed my first twelve months with Landcare NSW which have generally speaking been successful for the organisation. I am extremely fortunate to be working with a highly capable and effective Executive Committee, chaired by Stephanie Cameron. 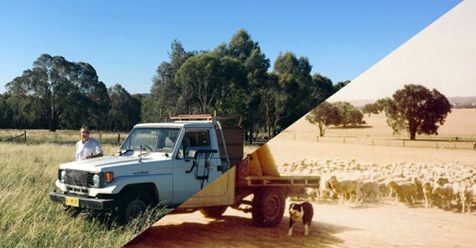 During this period we have seen Landcare NSW transform itself into a professional organisation with fit-for-purpose policies, processes and procedures that ensure good governance, leadership and management of our limited resources. During the past twelve months we have built a great team by recruiting some top talent including Matthew Farago (Business Manager), Alison McLaughlin (Government Relations and Communications Manager), Jane Nguyen (Membership & Projects Support Officer) and Linda Sereni (Executive Assistant), that complemented the fantastic staff who were already with the organisation before I joined. Landcare NSW has made some very significant progress during this period as well in meeting its strategic objectives. The most significant of these is the pledge from both sides of the NSW Government ($32.5m Labour; $22.4m Liberal/Nationals) to continue supporting the Local Landcare Coordinator Initiative for the next four years. Other significant milestones during this period include the $1.1m financial support received for FY19 from the state government, signing an MOU with the Biodiversity Conservation Trust, expansion of the Container Deposit Scheme fee-for-service program, a $500,000 DPI MEPAAW program and the generation of several significant opportunities for funding for Landcare from a number of other government and private organisations. In the past twelve months we have also commissioned a report that showed that Landcare in NSW delivers over $500m a year in triple bottom line benefits to the state of NSW. From my perspective, Landcare is an amazing brand that represents a fantastic grassroots movement with its heart at the well-being of its communities, farms and environment. It has a bright future but also has some significant challenges. I am therefore really looking forward to work with all NSW Landcare groups over the next few years to harness our collective passion and energy so as to attract more financial and volunteer resources to support and grow Landcare across NSW”. Alison McLaughlin was appointed as the new Government Relations and Communications Manager with Landcare NSW in January 2019. 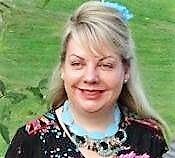 Her role assists in raising the profile of the organisation, managing the reputation of Landcare NSW, and ensuring a steady flow of information is provided to and from the community. Alison is passionate about the Landcare ethos and is enjoying being part of the Landcare family. “It is a pleasure to work with people who share the same vision, values and genuinely care about each other and work together as a team.I am looking forward to doing work that contributes to positive, long-term impact and supporting over 60,000 active Landcarers in NSW who invest their time in safeguarding our natural surrounds.”Alison’s multi-faceted background spans journalism, media relations, marketing, public relations, corporate communications, change management, and research, while personal network boasts extensive, state-wide media contacts. 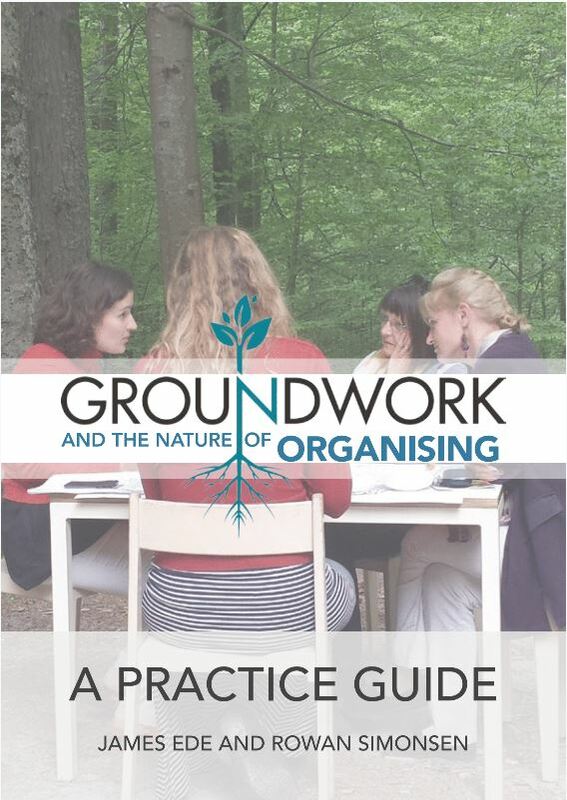 A new resource is available on ‘Groundwork and the Nature of Organising – a Practice Guide’. The principle of Groundwork Practice is applicable to Landcare at all levels when seeking collaboration and establishing projects including on-ground projects and designing the new coordinator program. Groundwork is setting and cultivating conditions to provide for successful engagement in conversations and collaboration. The investment in preparation of ‘the space’ to allow for effective collaboration is vital to set the conditions to bring about change. For more information, you can download the guide here. We would like to invite you to provide a personal review on the Landcare NSW google business page, to help build awareness to the public of the exceptional projects which are being undertaken and the work you do around the state. ← Get help to deal with financial hardship.